A scarce recording by the Original Bison City Quartette: from 1892, Rocked in the Cradle of the Deep. Announcement "Rocked in the Cradle of the Deep, sung by the Original Bison City Quartette, for the Ohio Phonograph Company, Cincinnati, Ohio." One of the regional members of the North American Phonograph Company, the Ohio Phonograph Company's catalog contained "New and Selected" recordings: 'Selected' implying master records purchased from other wholesalers (typically the New Jersey Phonograph Company), and 'New' suggesting recordings of local or touring talent. The latter probably is the case with this recording, as the Original Bison City Quartette (probably of Buffalo, New York) recorded this master record at the Ohio Phonograph Company's Cincinnati studios. Sheet music to Rocked in the Cradle of the Deep written by Willard & Knight, 1840. Presented courtesy of the Lester Levy Collection of Sheet Music. The photograph above, courtesy of the Lester Levy Collection of Sheet Music, shows a "Bison City Quartette" circa 1893. 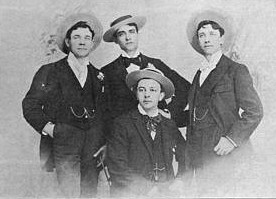 As to whether this is the "Original Bison City Quartette" is problematic in that the 'original' quartette appeared in record catalogs post-dating this photograph. An 1894 copy of sheet music held by trove.net lists the members of the Original Bison City Quartette at that time as George W. Hetzel, Frank A. Girard, Benjamin R. Cook, Harry C. West, and Lester L. Pike (one of the five presumably a pianist).